The Emek Tzurim Park lies in the upper reaches of the Kidron Valley, to the north-east of the Old City wall. The park covers an area of 170,000 sq. m. (42 acres) and is part of the National Park around the walls of Jerusalem. Some agricultural equipment that was used in this "agricultural backyard" of Jerusalem in various periods was discovered here (some of which has been left where it was and other parts have been taken away for preservation and future restoration). The Rockefeller Museum is a history and archaeology museum that is situated opposite the north wall of the Old City. The museum has many important historical exhibits from the area of Jerusalem and from the whole of the Land of Israel. The Museum has a particularly special building that is regarded as one of the finest in Jerusalem. The Museum was built from contributions of the American philanthropist, John D. Rockefeller Jr. and was named after him. The Museum was inaugurated in 1938 when it served as the official museum of the British Mandate and housed the offices of the Antiquities Department of the Mandatory Government. After the War of Independence the Museum was in Jordanian territory and was managed by a scientific board of directors, but was nationalized by King Hussein in 1966. In 1967, in the Six Day War, there was much hard fighting between the Israel and Jordan armies close to the Museum. After the unification of the city at the end of the war from being an independent museum it became an extension of the archaeology section of the Israel Museum. Today it also houses the Jerusalem District offices of the Antiquities Authority. The Lions' Gate is the name of one the gates of the Old City of Jerusalem. This gate was built between 1538-1539 and is located in the north-eastern part of the wall of the Old City, in the area of the Muslim Quarter. It is called the Lions' Gate after the two lions (they are actually cheetahs) engraved on both sides of the gate's façade. These cheetahs are the emblem of the Mameluke Sultan Bibars. It would seem that they were taken from somewhere else in the country and positioned here as a secondary use. In the battle for Jerusalem in the Six Day War, a force of the Paratroops Brigade broke into the Old City through this gate. The Golden Gate (called the Gate of Mercy in Hebrew) is situated in the eastern wall of the Temple Mount, opposite the Mount of Olives. The gate has two openings and they have both been blocked off for many years. The gate structure is older than the construction of the Turkish wall and it has on it artistic representations from various periods. In Second Temple times one of the gates of the Temple – the Shushan Gate, or as it was also known, the East Gate, stood here it would seem. In medieval times people prayed here facing the gate. The remains of Jewish pilgrims' inscriptions from the Middle Ages have survived on the inside of the gate frame. The huge complex, which has at its centre today the Dome of the Rock mosque, is the Temple Mount, a part of whose massive walls can still be seen surrounding the area. This complex was constructed by King Herod the Great and he encompassed Mount Moriah from the south, from the west and from the north with enormous supporting walls when he rebuilt the Temple towards the end of the Second Temple Period. Mount Moriah, on which Abraham bound Isaac, is hidden under this huge stone 'container' with which Herod enclosed the mountain. David bought Mount Moriah from Araunah the Jebusite for the purpose of building the Temple here. King Solomon built the First Temple, which was destroyed by the Babylonians in the year 586 BCE, on the Mount. The returning exiles from Babylon laid the foundations of the Second Temple in the same place in 536 BCE and after about 500 years Herod extended the Temple Mount and rebuilt the Temple on it. Herod's construction is known for its magnificence and great beauty. It was destroyed in the year 70 CE by the Romans. About 600 years later the Muslims repaired the Temple Mount complex, renewed its walls and gates and built on it the Dome of the Rock and the El Aksa mosques. 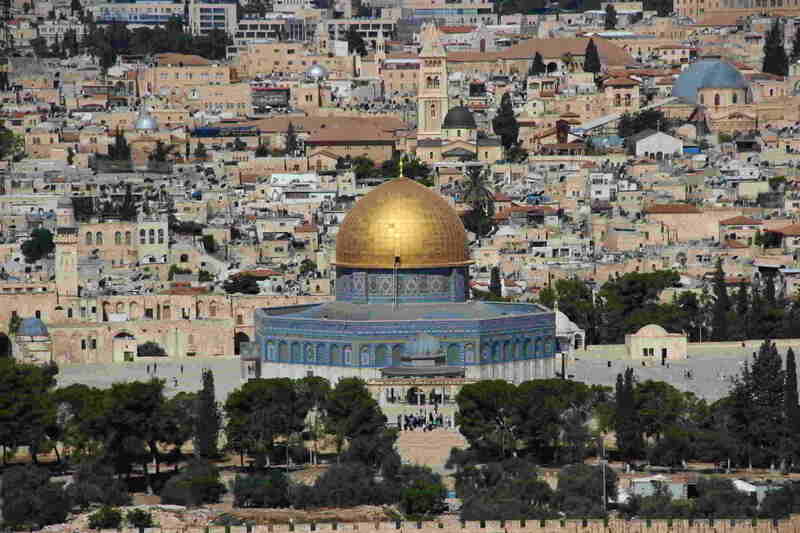 The Golden Dome is known as the Dome of the Rock and marks the place of the rock which, according to Jewish Tradition, is called the Foundation Stone "since from it the world was founded" that was in the Holy of Holies of the Temple. Until 1860 Jerusalem consisted only of the area between the walls of the Old City. In that year the building of residential neighbourhoods outside the walls began, and so, in fact began the development of the New City of Jerusalem. From the summit of the Mount of Olives one can see a sizeable proportion of the New City. To the north, on the continuation of the Mount Scopus hills can be seen the Hebrew University and the northern districts of the city such as Ramat Eshkol and Ramat Shlomo. Further to the west, going up the hill, lie the Ultra-Orthodox neighbourhoods of the city and beyond them the complex of the Municipality buildings. Directly to the west is the city centre with its towers and the Great Synagogue "Hechal Shlomo"; to the front, the old established King David Hotel and the newer King Solomon Hotel. Continuing on one can see the City Centre and the residential neighbourhoods of Rehavia, Kommemiut (Talbieh) and Gonen (Katamon) and above them the white houses of the Givat Masuah neighbourhood. To the south lies Ramot Rachel and the hills of Kibbutz Ramat Rachel. In these excavations, that are close to the Herodian southern wall of the Temple Mount, many findings from the Second Temple Period have been made. The magnificent street of shops under Robinson's Arch, the steps leading up to the triple Huldah Gates, that served as the main entrance to the Temple Mount in the Second Temple times and the many ritual baths for the pilgrims are only a part of the impressive findings uncovered here. There is a large Visitors' Centre, the Davidson Center, on the site, which uses films and exhibits to illustrate how the city looked during different periods in its history. From the time of the destruction of the Second Temple, Jewish settlement in the Old City moved from place to place, until some 600 years ago, it took root in the area where it is today. At the beginning only a few families lived in the Quarter, but over the years their numbers grew so that by the middle of the 19th century many of Jews from the Old City were obliged live in other Quarters of the city, because of lack of room in the Jewish Quarter. With the beginning of Jewish settlement outside the city walls in 1860, there occurred an erosion in the status and importance of the Jewish Quarter, and its population gradually diminished until the city fell to the Jordanians in 1948. For 19 years the Jewish Quarter stood empty of Jewish residents, but was repopulated after the Six Day War. Mount Zion reaches a height of 765 metres above sea level and at its summit, according to popular tradition lies the grave of King David. In the Byzantine Period this western hill of Jerusalem began to be called by the name of Mount Zion, but from the Bible it transpires that Mount Zion was actually another name for Mount Moriah (II Kings 19, Micah 4, Psalm 48 and others). Towards the end of the First Temple Period Mount Zion and the area to its north were included within the city wall and its biblical name was Hamishne (the Secondary Hill). In Second Temple times the Jerusalem aristocracy – primarily the Priests – lived here and it was called "the Upper City". The City of David is the ancient core of biblical Jerusalem. On the long hill coming down from the Temple Mount lies the Jebusite town in which David chose to establish the capital of the tribes of Israel. David's son, Solomon, connected Mount Moriah to the city and built the Temple on it as well as the magnificent royal complex. Later the city spread to the western hill that today houses the Jewish Quarter, the Armenian Quarter and Mount Zion.The remains of the biblical city are still visible today in the City of David and one can still go through the ancient water systems from Canaanite times and from the reign of King Hezekiah that were hewn deep out of the rock in ancient times. The tombstones in the Kidron Valley – The Absalom Monument, Zechariah's Tomb and The Tomb of Bene Hezir At the bottom of the Mount of Olives, close to the bed of the Kidron Valley, are a number of extremely impressive burial structures carved in the rock. These are burial caves and commemorative tombstones of the rich of Jerusalem and its priests that scholars think were built towards the end of the Second Temple Period. Despite their relatively late dating, they are popularly known by names connected with biblical events. The Kidron Valley has always served as the eastern geographic and municipal border of the City of David and Jerusalem. The Kidron Valley begins in the Sanhedria Neighbourhood and finishes its journey by running into the Dead Sea. In First Temple times the Kidron Valley was particularly fertile because of its large amount of sedimentary soil, the plentiful heat in the area and the abundance of water along the riverbed. Over the years the sediment continues to accumulate so that today its level is 18 metres higher than its original level. The Gihon Spring is a karstic spring that stems from a slope going down to the City of David and constituted a main water source of the city from its first beginnings. In the past the spring's water alternated between a stronger and a weaker flow (from which it got its nickname of "Maayan Po'em" – the Throbbing Spring) and it is possible that the name Gihon also hints at this. The water of the spring was used by the city dwellers as drinking water and it was also channeled southward in the Caananite aqueduct (known as Channel 2) to irrigate the agricultural fields in the Kidron Valley. It was by this spring that King Solomon, the son of King David, was crowned as king of Israel… " [they] caused Solomon to ride on King David's mule, and brought him to Gihon. There Zadok the priest took the horn of oil from the tent, and anointed Solomon. Then they blew the trumpet; and all the people said, "Long live King Solomon!" (I Kings 1:38-39). The spring's water was also used in the Temple service, in the libation ceremony, for purification and for the water of expiation. In the period of Hezekiah, King of Judah, an underground tunnel was hewn out to take the spring's water to the other side of the city, to the Pool of Shelah. The ancient and most important cemetery in Jerusalem is on the Mount of Olives. The Mount was used a burial ground of the Jews of Jerusalem from as far back as the days of the First Temple, and continues to fulfil this function to the present day. During the First and Second Temple Periods the Jews of Jerusalem were buried in burial caves scattered on the slopes of the Mount, and from the 16th century the cemetery began to take its present shape. Many famous names are buried in the cemetery such as the Ohr ha-Chaim, Rabbi Chaim Ibn Attar and Rabbi Yehuda Alcalay who were among the heralds of Zionism; Hassidic rebbes of various dynasties and Rabbis of "Hayeshuv Hayashan" (the old – pre-Zionist - Jewish settlement) together with Rabbi Avraham Yitzchak Kook, the first Askenazi Chief Rabbi, and his circle; Henrietta Szold, the founder of the Hadassah Organization and the poetess, Elza Lasker-Schiller, Eliezer ben Yehudah, the father of Modern Hebrew, Sh. Y. Agnon, the Nobel Laureate for Literature, and Boris Schatz, the founder of the Bezalel School of Art; Israel's sixth Prime Minister, Menachem Begin, the victims of the 1929 and 1936-39 Arab riots, the fallen from the 1948 War of Independence, together with Jews of all generations in all their diversity. The Armon Hanatziv Hills lie to the south of the Old City and their summit is some 800 metres above sea level. The hills are called after the Mansion House of British High Commissioner that was built there in 1931. Some people associate this area with the point from which Abraham first saw the Mount of Moriah when he came up from Beer Sheva intending to sacrifice his son, Isaac in what is referred to in the Bible as "the land of Moriah". In Second Temple times an aqueduct was quarried through the hills (known today as the "Lower Aqueduct") to bring water from Solomon's Pools, close to Bethlehem, to the Temple Mount and the Temple. In the Six Day War, it was here that the fighting began between Jordan and Israel and after the Commissioner's Mansion had been recaptured by Israeli troops, it was from here that the Jerusalem Brigade set out to retake the Old City.